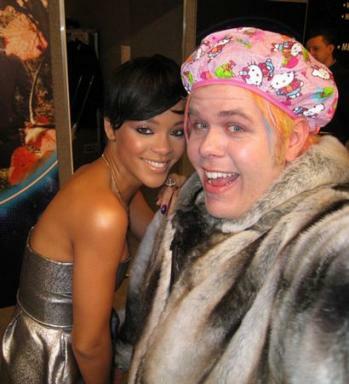 It seems to me that Perez Hilton wearing a Hello Kitty shower cap as a fashion statement pretty much sums up everything wrong with Hello Kitty. It’s seeing photos like this that make me think that there are great advantages to being blind. I guess it does serve a purpose of sorts – with all the people that must get sick around him when he is wearing that, at least his hair has some protection from the flying food chunks.